Get free traffic to your websiteblog in just 1 minute! Sign up, add your website for free and get 100 bonus points. Traffup users prefer to visit websites that offer more points. Your website is visiblelongyou've points in your account. Visit other websites on Traffup to earn free pointsbuy points pack to keep your website visible. 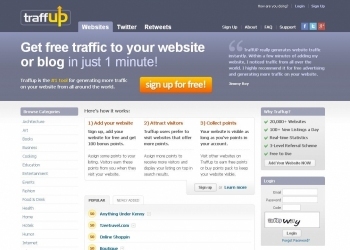 Use TraffUP to get hundreds of free Twitter followers every day. Enjoy the benefits of more Twitter followers i.e. more traffic and more sales in just 3 simple steps. TraffUP is absolutely free and safe to use. Join our community and find new friends and followers on Twitter every day. Sign up and create your Twitter profile. You get 100 bonus points to enable you to get started on TraffUP. We never ask for your Twitter password. Users earn these points (from you) when they follow you. Also write something interesting about yourself and assign more points to attract more followers. Your Twitter profile is visible to userslongyou've points in your account. Earn FREE points for your account by following other interesting users. Spread your messages all over Twitter using free Twitter retweets. Retweets is a great way to get your message out to millions of users on Twitter. Just add your message, assign some points and let thousands of Twitter members on TraffUP retweet your message and share it with all of their followers. Once you sign up you get 100 bonus points. Users earn points when they retweet your message on their profile. Assign more points to your message and attract more users to retweet it. Your tweetmessage is available for sharinglongyou've points in your account. Retweet other's messages to earn points for your account.